States are now enforcing strict texting while driving laws and public service like AT&T’s campaign It Can Wait are working hard to educate the public on the dangers and consequences. 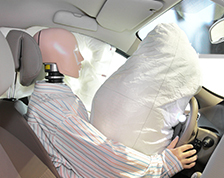 The Insurance Institute for Highway Safety (IIHS) reports newer vehicles are dramatically safer than the older models. It's a no brainer that as time goes on technology evolves — just think how it has impacted the computer and cell phone industry. Get the facts on what safety features rate best.